Q: Hide the flash flip book frame bar. There is a book frame bar showing beside the book pages and I want to hide it when it is not needed. As I think the flash flip book interface can be more concise without it. There is a design setting panel in the right of the flash window. 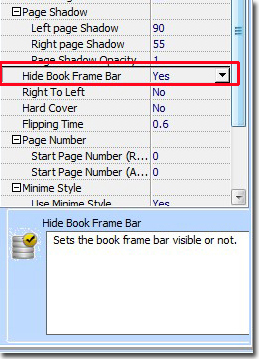 You can find the “Hide Book Frame bar” and transfer “No” to “Yes”. And then apply change to see the result what you want.